The body is the physical manifestation of the Soul. Eastern thought opens awareness to the ”chi” or “prana.” Both words mean “Life Force.” The body perfectly and consistently informs us. It informs us through pain or relief, disease or healing, and strength or weakness. 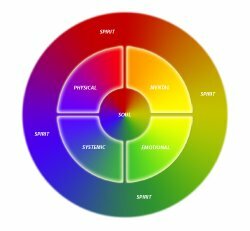 The Chakra system provides information about the psychological issues connected with what the physical body is manifesting. Somatic therapies watch how events, thought and feelings are processed through the physical body; thus, the individual has the opportunity to process experience as it arises. Breath work, energy work and body movement can be used to access the connection between self and transendent realms. Pharmaceutical treatment can interface with the bio-chemical action in the brain. From an integrative perspective, any form of medical or physical care can be utilized in supporting the mind/ body/spirit connection when done with cognition and inclusivity of all aspects of the person. One can follow the information of the physical body to discover what questions one needs to ask and the direction to be taken.